A black and white large format negative of James and Alfreida Bremner and their wedding party taken in March of 1947. In this view from left to right: Doris Bremner, Alfreida Love Bremner, James Bremner and Peter Bremner. Mr. and Mrs. James Bremner were married in March of 1947. James is the son of Alexander and Janet Bremner. 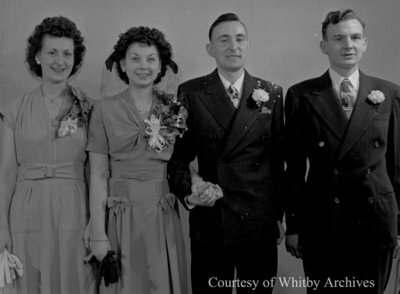 Bremner Wedding, March 1947, Marjorie Ruddy. Whitby Archives A2013_040_600.